When looking back and thinking about your favorite childhood books that helped shape our imagination and inspire wonder, what pops into your head: A dry, to-the-point science textbook, or an elaborate picture book about Mexican jumping beans? Karen Ansberry and Emily Morgan have theorized that reading science textbooks alone won’t capture a child’s attention enough to have them retain the information they’re learning in science class. If you combine science lessons with interesting picture and story-books, however, they will have something to relate this new information to, and there’s a better chance they will understand these new concepts in more depth. 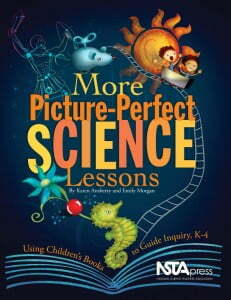 In this curriculum book, K-4 teachers can plan out reading lessons that will lead into scientific discussions and projects that will have students excited about science once again!